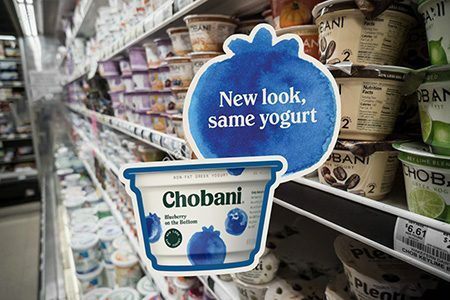 Chobani's new look is inspired by 19th century American folk art. McGuinness might not be picking on his competition, though he may be about to scare them all over again. 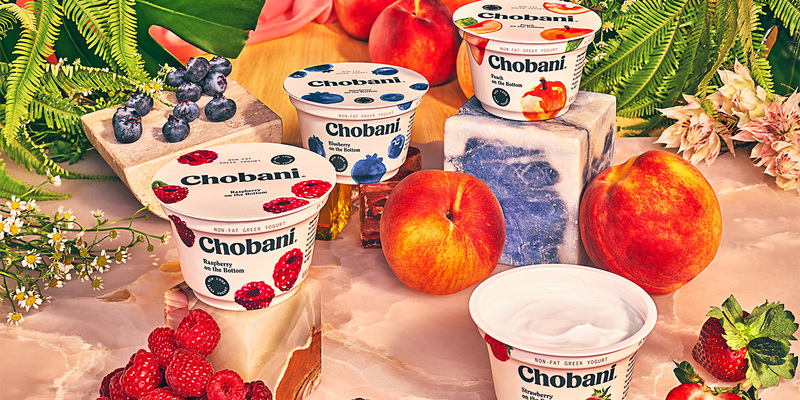 Today, Chobani is going public with a comprehensive reimagining of its brand identity that will, it maintains, position the yogurt giant for the next decade. For one thing, Chobani has moved beyond its identity as just a yogurt company and is now a “food-focused wellness company,” focused around the utopian-sounding axiom of: “Fighting for happily ever after.” This broader positioning will be evident on the company’s web site and in new advertising to commence next year—advertising that will promote the overall nutritional benefits of yogurt, tout its many uses including as a substitute for recipe ingredients like sour cream, and encourage consumers to eat yogurt throughout the day with products like its Flip snacks. But the most visible manifestation of Chobani’s brand evolution will be where most people see it: on store shelves. The company has completely redesigned its packaging, tossing out the usual white cups with the fruit photos in favor of a design inspired by 19th century American folk art, featuring a color palette borrowed from leaves and flowers and bark, and illustrations reminiscent of old seed catalogs. Overall, McGuinness says, these new initiatives are a response to Chobani being “not happy with where the category is” and, if all goes as planned, the measures will “bring the specialness back” to yogurt. It’s anyone’s guess how to measure specialness, but one thing’s clear: Chobani had to do something. While the $2 billion brand is still very healthy—it overtook General Mills’ Yoplait last year to become the No. 1 yogurt brand in America, and its topline growth for 2017 is up by double digits—Chobani’s ambitious plans come at a time when the yogurt category has soured a bit. Part of the reason for this situation is, no doubt, that there are only so many Americans with a taste for yogurt in the first place. But the larger part of it is that Chobani’s own innovations set in motion a competitive response that helped produce the quagmire it’s now trying to extricate itself from.